Build terrifyingly detailed scenes from IT, the 2017 movie based on Stephen King's original novel, with this new deluxe accessory set! These incredible pieces are perfectly in scale with NECA's line of 7-inch figures and include some truly iconic items from the acclaimed horror film. 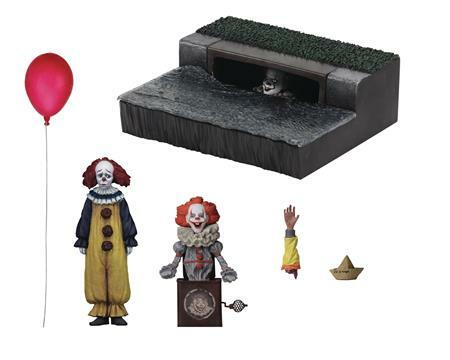 The set comes in closed box packaging and includes the Sewer Diorama Display Base that features an exclusive-deco Pennywise face peeking out from the sewer grate and measures over 6-inch x 6-inch (across and deep) and 2-inch tall! The Pennywise Jack in the Box Accessory stands over 3-inch tall, the Pennywise Puppet (as seen in the Well House Clown Room) measures 4-inch tall. Also includes a Georgie Severed Arm Accessory, SS Georgie Boat Accessory, and a Red Balloon.